The newly opened extension to the Great Southern Trail [GST] at Abbeyfeale, Co. Limerick was extremely well patronised over the Christmas break with scores of people availing of the holiday period to visit the 2 mile development which has brought the GST to the Co. Kerry border. The official walk organised by the GST to celebrate the occasion took place on Thu. 27th Dec. and attracted a couple of hundred walkers and cyclists. 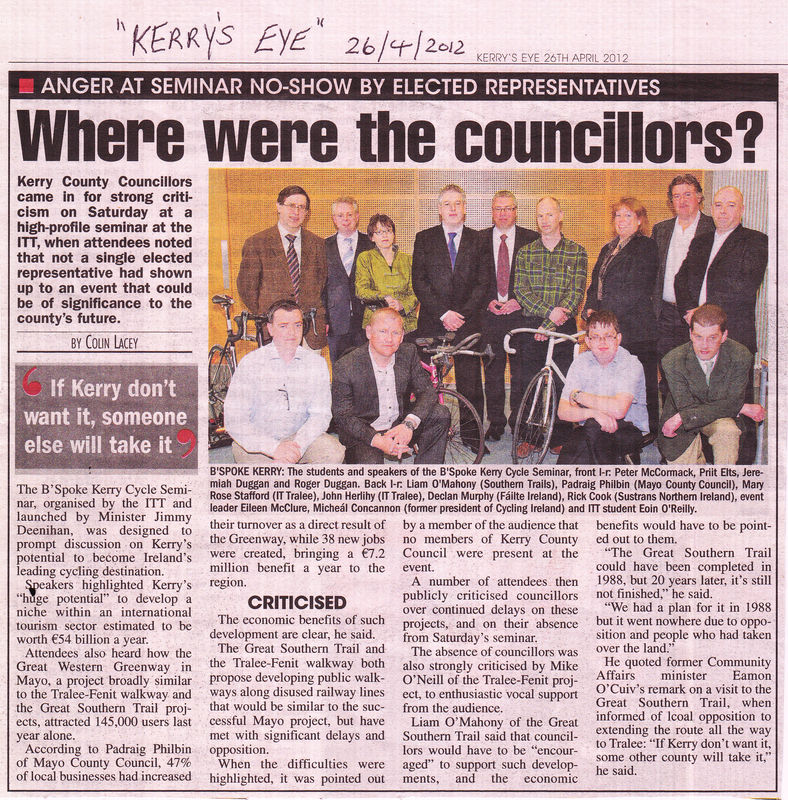 Limerick Co. Co., who carried out the work on the extension with National Cycle Network funding, were represented by Cllr. Francis Foley and Anthony Coleman of the Community & Enterprise Section. Mr. Coleman co-ordinated the overall project and is to be complimented on the outcome. Mr. Gerald O' Carroll, historian and Tralee native, was among the large Co. Kerry representation and he addressed the crowd on the history of the ancient Purt Castle which is adjacent to the Trail. Coach House Travel provided complimentary transport from Rathkeale and at journey's end the GST provided refreshments at the Railway Bar, Abbeyfeale. Saturday 2nd February, 2013 will be the 50th Anniversary [day and date] of the last Limerick-Tralee daily scheduled passenger train and to mark this significant historic day the GST will host another walk at 2.15pm from Abbeyfeale to Duagh village. This will include a mile of an as yet undeveloped section in Co. Kerry so waterproof footwear/ wellingtons may be required. Great Southern Trail Annual Christmas Walk on Dec. 27th at 2.15pm. Recently a new bridge was installed over the Athea Road at Abbeyfeale, Co. Limerick to provide access to the latest 3km of the Great Southern Trail [GST]. Forty kilometres of the GST has now been developed between Rathkeale and the Kerry Border [at Rathoran townland]. The GST will host the first walk along the new route on Thu. 27th December at 2.15pm from the old Abbeyfeale Station. The round trip is 4 miles and refreshments will be provided afterwards at the adjacent Railway Bar, Abbeyfeale. All the faithful supporters of the GST over the past 21 years are cordially invited as are all those who worked so diligently on the new extension and completed the job so quickly. Sincere thanks also to the adjoining landowners for their co-operation and to CIÉ for permitting their former railway to be converted into a public amenity. Tá fáilte romhaibh go léir! Red Letter Day on Great Southern Trail at Abbeyfeale 7/12/12 plus Celebratory Walk on Dec. 27th at 2.15pm. On Friday Dec.7th 2012 a new bridge was installed over the Athea Road at Abbeyfeale, Co. Limerick to provide access to the latest 3km of the Great Southern Trail [GST]. Forty kilometres of the GST has now been developed between Rathkeale and the Kerry Border [at Rathoran townland]. These works have been undertaken by Limerick County Council with National Cycle Network funding. The GST group welcomes this initiative by the County Council and now looks forward to the continuation of the Greenway into County Kerry to the finali termini at Tralee and Fenit. At Limerick County Council level the project was led by Anthony Coleman with the resurfacing being supervised by Pádraig Vallelly and Richard Gleeson. The overall Consulting Engineer was Tadhg McGillicuddy who also co-ordinated the installation of three new bridges. 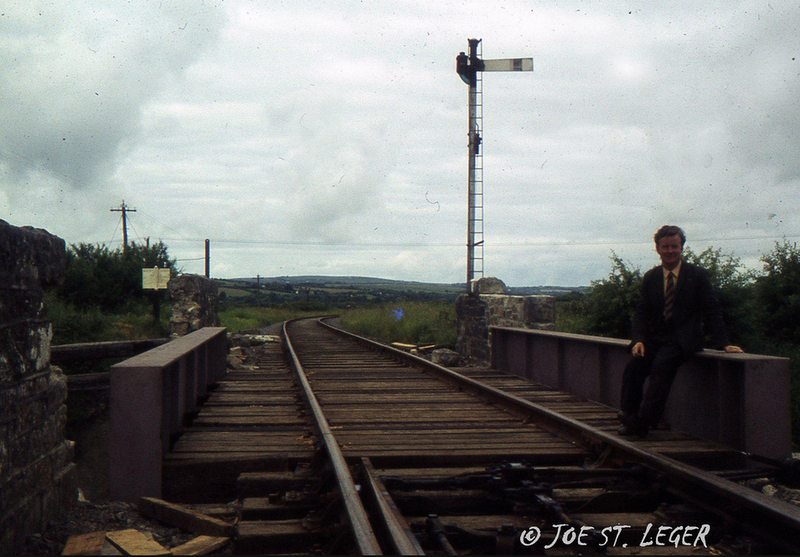 These were manufactured and installed by Fergus O' Keeffe, Kerry Mechanical Engineering, Kilmorna [over the Athea road at Abbeyfeale Station]; Pádraig Nolan, Nolan Steel, Castleisland [over the River Oolagh outside Abbeyfeale] and Mike Condon Trackcare, Devon Road, Templeglantine [over a farm roadway at Purt, Abbeyfeale]. The GST will now host the first walk along the new route on Thu. 27th December at 2.15pm from the old Abbeyfeale Station. The round trip is 4 miles and refreshments will be provided afterwards at the adjacent Railway Bar, Abbeyfeale. All the faithful supporters of the GST over the past 21 years are cordially invited as are all those who worked so diligently on the new extension and completed the job so quickly. Tá fáilte romhaibh go léir! Fáilte roimh gach éinne to meet at the Old Station , Bishop Court, Newcastle West (Town Centre), Co. Limerick at 2.30 p.m. for the 8 mile walk/cycle to Rathkeale along the old railway. Please note that return transport will not be provided by the GST. However, Bus Éireann services depart Rathkeale at 2.10 p.m., 5.10 p.m. and 6.10 p.m. and can be used to either join the walk or to return afterwards. The first Joint Conference of the European Cycling Federation (ECF) and the European Greenways Association (EGWA) was held in the city of Nantes, France on Wednesday Sept. 26th 2012 and was addressed by speakers from about a dozen countries throughout Europe. Guest speakers from the USA and Australia also made presentations. Ireland was represented by Mr. Brian Quinn, Fáilte Ireland who spoke on behalf of the Great Western Greenway, Mayo and by Mr. Liam O'Mahony, Cathaoirleach, Great Southern Trail (GST) who informed the International gathering of the ongoing development of the GST. Mr. O'Mahony particularly welcomed the proposals by ECF/ EGWA in tandem with E.U. bodies to focus future cycling development on fourteen specific long-distance trans-national European Cycle routes. Some of these 'EURO-VELO' routes http://www.ecf.com/projects/eurovelo-2/ are well established with others being partly developed. Two of the routes include Ireland with Route 1 beginning in Portugal and hugging the Atlantic Seaboard of the E.U. all the way to the North Cape in Norway. With this Route 1 following the path of the Great Southern Trail and, considering that the GST is already included in the National Cycle Network, the long campaign of the GST to secure the old Limerick-Tralee/ Fenit railway as a Greenway has been further vindicated. In his address Mr. O'Mahony outlined the progress made in developing the 40 Km of rail-trail in Co. Limerick and expressed the appreciation of the GST to all the supportive bodies and public representatives as well as to the general public and the adjoining landowners. He did emphasise that it took twenty years of campaigning to achieve this success and that there should be no such delay in completing the Co. Kerry section of the route. In this regard it is essential that the relevant State, Regional and Local Authorities plan accordingly and that public representatives be also involved. When complete the entire Greenway will be of enormous benefit to locals and tourists alike with the North Kerry/ West Limerick economy also benefitting. The spending power of 'Cycling Tourism' was mentioned by speakers from several countries, as well as by Mr. Quinn from Mayo, and it was emphasised that the return far outweighed the outlay in constructing these trails. Attached are the plans by Limerick County Council to extend the Great Southern Trail by 3Km westwards from Abbeyfeale. The GST welcomes this development and commends both this Co.Co. initiative and the National Cycle Network section of the Dept. of Transport for funding same. Submissions by the public are welcome to cdb@limerickcoco.ie before Nov.2nd. The planning reference is 12/6006 and your name and postal address must also accompany any submission. There is no fee required. The GST would appreciate you making an observation to the Council in support of this development. Recently Tralee Town Council approved development of the first section of the Tralee- Fenit portion of the GST having received over 200 positive submissions. This tangible evidence of public support is essential in ensuring the speedy completion of the entire Ballingrane Junction (near Rathkeale) to Fenit Greenway which will provide a 96Km amenity to locals and tourists alike. Mr. Joe St. Leger R.I.P. The death has taken place in Cork on Thursday 19th September 2012 of Mr. Joe St. Leger R.I.P. Joe, who was in his eighties, was one of Ireland's foremost and most well known and loved railway photographers for over fifty years. He travelled the length and breadth of the country and photographed many lines now long gone. Theme Tracking the Old Railway Greenway. Nearest town and county Newcastle West, Co. Limerick. Meeting point Old Station, Bishop Court, Town Centre, Newcastle West. The Bus Éireann service at 1pm from Tralee to Limerick will serve participants from North Kerry with the 1.35 pm service from Limerick to Tralee also connecting with the walk whose starting point is a 10 minute walk from the Newcastle West bus stops. Return services from Rathkeale to Limerick (5.25pm) and to Tralee(6.10pm). Heritage Sunday August 26th promises to be a very busy one on the Great Southern Trail[GST] with a number of interconnected events taking place. Firstly, at 2pm there will be a guided tour of the 132 year old Barnagh Tunnel [parking on the N21 lay-by 4 miles west of Newcastle West, Co. Limerick]. Following this, at 3pm, a 13Km [8 miles] walk/cycle along the old railway to Ardagh will set out from Barnagh Lay-by. This is a very easy downhill route and a welcome cupán tae with Joan Molyneaux's famous homemade scones will be awaiting at Ardagh Community Hall from 5pm. Meanwhile, outside that Hall there will be a demonstration from 5pm to 6.30pm of stonecrushing by vintage machines powered by similarly ancient tractors; some venerable trucks being also present. This event has been organised by the West Limerick Vintage Club whose participation is greatly appreciated by the GST. Inside the Community Hall, at 5.30pm, Dr. Pat O'Connor, Geographer, Author and Poet who has recently retired from U.L. will launch the newly published Guide to the GST Co. Limerick section of the Greenway. This gives comprehensive information on the 37Km route. Finally, at 6.30pm Coach House Travel will provide complimentary return transport to Barnagh Lay-by for all walkers requiring same. Beidh fáilte roimh gach éinne ar an lá. The Great Southern Trail [GST ] has just published a new guide for walkers and cyclists to the developed Co. Limerick section of the old Limerick to Tralee railway line. Over 35 Km of Greenway is now available for off-road recreation and the guide gives directions to the principal access points along the route between Rathkeale and Abbeyfeale. The guide also provides a map detailing the Co. Kerry section of the old railway; most of this is as yet undeveloped but remains in CIÉ ownership. The brochure will be formally launched at Ardagh Community Hall on Heritage Sunday 26th August at 5.30 pm. The GST acknowledges the support of West Limerick Resources and Limerick County Council. All are welcome to the Barnagh Lay-by on the N21, four miles west of Newcastle West, Co. Limerick to the family cycle morning on Sat. August 11th between 9.30am and 1pm. This event is being organised in connection with the Monagea/Strand Annual Pattern Festival. Free bicycle rides will be provided by local businesses GS Cycles and Adrenaline Sports. The event provides an ideal introduction to cycling for children as the route will be off-road along a section of the old railway, now the Great Southern Trail. Children requiring bikes will be be taken in supervised groups of ten but of course families are welcome to bring along their own bikes ( and helmets) also. Event Description: Visit Barnagh Tunnel (2pm); scenic 13km railway walk/cycle at 3pm from Barnagh to Ardagh for working vintage stone crusher demonstration (5pm-6:30pm). Refreshments at Ardagh and complimentary return transport to Barnagh. Stone Crusher pictured. The Tralee-Fenit Railway Group have asked that the attached letter be circulated for your attention and the Great Southern Trail (GST) is happy to oblige as we look forward to the day when there will be a continuous 60 mile rail-trail running from Rathkeale to Listowel, Tralee and Fenit. Therefore, I hope that you will write or email the Council before next Thursday to express your support. SUCCESSFUL GREAT SOUTHERN TRAIL "BIG WALK" DESPITE THE SUMMER WEATHER! Prayers were answered last Saturday when a dry day appeared over the horizon in Rathkeale as about 50 people gathered to commence the 22 mile annual challenging walk on the Great Southern Trail. The walkers were addressed by Cathaoirleach Liam O'Mahony before they set off. The same morning saw about 20 cyclists in independent groups also utilising the amenity. The previous week saw 55 of the Limerick Walking Association led by chairman Seán Fitzgibbon making a repeat visit to the GST. The group took a lunch break in Newcastle West and by tea-time 25 had completed the entire route to Abbeyfeale. Following refreshments at the Railway Bar certificates were presented by secretary Mike Mac Domhnaill to the footsore but contented finishers with five Munster counties being represented. All were eager to return next year to participate in what is hoped to be an extra special event as part of the Gathering 2013. Furthermore the anticipated completion of the section westward to Abbeyfeale may result in the GST being able to host a marathon. The Great Southern Trail welcomes the announcement of €290,000 funding from the Department of Transport to enable Limerick County Council to extend the rail-trail from Abbeyfeale to the Co. Kerry border. The GST thanks Limerick County Council. for its initiative in applying for the grant which complements recent funding of over €60,000, by West Limerick Resources to upgrade the existing Barnagh- Abbeyfeale section of the trail. 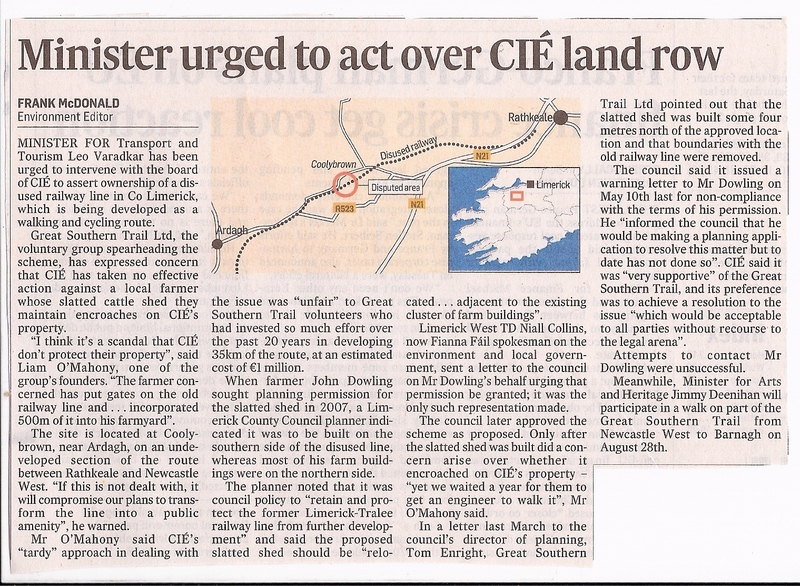 We now look forward to similar initiatives by Kerry County Council and North & East Kerry Development to develop the trail onwards to Kilmorna, Listowe, Lixnaw, Abbeydorney, Ardfert and Tralee where it will link up with the Tralee-Fenit trail already under construction. On Saturday 16th June 2012 the second annual 22 mile [35 Km] MIDSUMMER "BIG WALK" will commence from Rathkeale [Palatine Museum 10.30 a.m.] and travel the route of the old railway to Abbeyfeale. 6.30pm:Arrive Abbeyfeale: Refreshments and Presentation of Certificates to those who complete the entire 22miles. Bus Éireann connections with the walk at Rathkeale are from Limerick (9.35am), Adare(9.55am), Tralee (9am), Listowel (9.30am), Abbeyfeale (9.55am) and Newcastle West (10.15am). Return Bus Éireann services from Abbeyfeale to Limerick(6.55pm and 7.55pm) and to Tralee(6.40pm and 8.40pm). Those using their own transport can park at Rathkeale; the GST will provide complimentary return transport to Rathkeale at 7.30 pm. All who complete the entire route on foot will receive a Certificate on condition that they have registered in writing in advance. The registration fee is €10 per person (irrespective of age) and should reach Liam O' Mahony, 9 Bishop St., Newcastle West, Co. Limerick by Monday 11th June. Last year 36 people completed the 22 miles. Those intending the full walk are advised to bring along adequate food/water for the eight hours. Of course anyone who wishes to walk or cycle a portion of the route is welcome to join in at any stage along the way. Bí linn agus bain taitneamh as an lá! 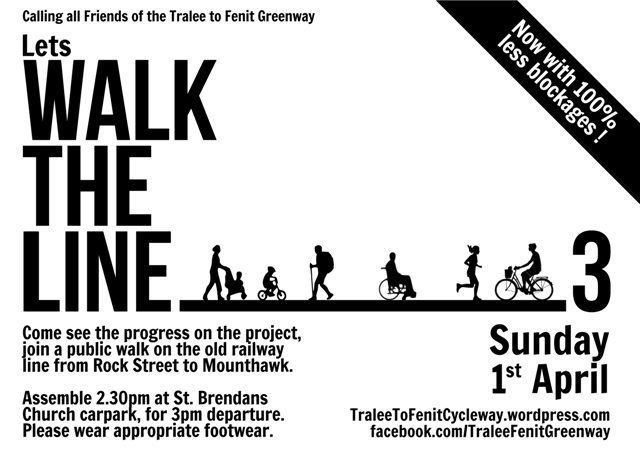 About 40 people walked from Templeglantine to Abbeyfeale along the old railway on Bank Holiday Monday 7th May 2012. This section is currently being upgraded with two local businesses involved. Declan Stack is looking after the access points, surfacing and drainage while Mike Condon, TRACKCARE, is providing a replacement bridge at the Tullig Wood entrance. The GST is being assisted in these works by West Limerick Resources and Limerick Co.Co. There will be a Churchgate Collection in Templeglantine for the GST on 12/13 May. A cycling group travelled along the GST from Newcastle West to Abbeyfeale and back in April; their photographic record is available on www.4x4sb.com/cycling/the-southern-trail-45km-irl . The GST's next event is the 2nd Annual "BIG WALK" of 22 miles/ 36Km from Rathkeale to Abbeyfeale on Sat.16th June. Public Walk this Sunday, 1st April. It's just a short walk (max 1 hour) to showcase the recent work done on clearing the Rail line from Rock St to Mounthawk. We are hoping to get a good crowd if the nice weather holds ! Tralee IT will be running a conference aimed at promoting cycle tourism in Kerry on Saturday 21st April. Titled Developing Cycling Tourism in Kerry – The Challenges and Opportunities the conference will present ideas on how to develop cycling tourism which will be of interest to community tourism groups, tourism businesses and local authorities who will be eager to explore the potential of cycling as a tourism product for development in Kerry. Cycling has increased as a leisure activity in Ireland and offers excellent potential for development. The seminar will include speakers involved in developing ‘From Start to Finish’ The Great Western Greenway in Mayo, generating €7.2m in the local economy in addition to a presentation from Great Southern Trail, a voluntary group who have developed a trail along the old Limerick-Tralee Railway. Representatives from various tourism development agencies will also outline the supports available to assist developments in this area. Steven Patterson, from ‘Sustrans‘, a pioneer of the ‘Safe Routes’ concept in the UK & Northern Ireland will also address the conference. For further infonnation and bookings please contact: Mary Rose Stafford, Centre Manager, Hospitality & Tourism Unit, Institute of Technology Tralee Co. Kerry. Tel 066-7191664. On Monday March 19th at 3 pm a walk will set out from the Old Station, Bishop Court, Newcastle West to Templeglantine. The distance is 14Km (over 8 miles) and includes the new 1 mile cycleway at Barnagh which greatly adds to the safety of GST users at this location. Please note that return transport will not be provided by the GST; participants must make their own transport arrangements to return to Newcastle West. Bus Éireann coaches depart Templeglantine at five minutes past each hour for Newcastle West - Limerick and at half-past each hour for Abbeyfeale - Kerry. All are welcome to the Public Library, Gortboy, Newcastle West on Tuesday 20th March at 8 pm for an evening of nostalgia as scenes from the 1970s of where the trains once ran will be presented during a slide show by Richard Wall-a lifelong railway enthusiast who travelled the route and captured images at a wide variety of locations. Entitled "A journey by train from Limerick to Tralee - Fenit and Castleisland" the event will be of special interest to those whose families worked on the railway but will also remind present-day walkers / cyclists of the rich heritage of the route. Fáilte roimh gach éinne. The Great Southern Trail in the last years of railway operation. railway enthusiast who travelled the route and captured images at a wide variety of locations. Entitled "A journey by train from Limerick to Tralee/ Fenit and Castleisland" the event will be of special interest to those whose families worked on the railway but will also remind present-day walkers / cyclists of the rich heritage of the route. 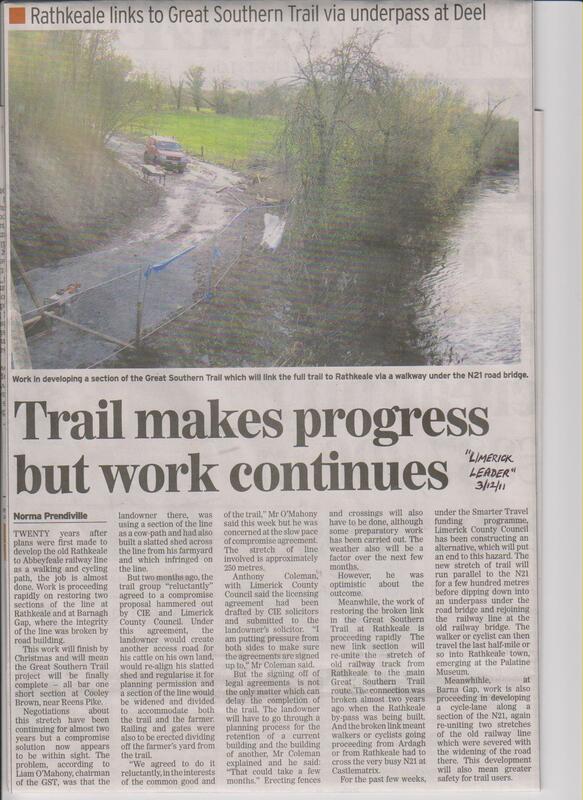 As the attached article indicates, the delay in completing the Trail at Coolybrown continues. If you have already contacted Minister Leo Varadkar minister@dttas.ie, Ms. Geraldine Finucane, Company Secretary, CIÉ geraldine.finucane@cie.ie and Secretary Limerick Co. Co. secretar@limerickcoco.ie re resolving the matter, then thank you. If not, please consider doing so immediately as your collective voices will hopefully encourage officialdom to act forthwith. In making contact, don't forget to include your name and postal address and to request an acknowledgement / response. The AGM, which actually covered a two year period, was informed of Churchgate Collections and cash donations amounting to €10,000 approx. This was complemented by donations of several seats, located along the route, by Biddy Foley, Máire Ní Chearmada, Noreen O Connor, Trish and Donal Sexton. Refreshments on Walk Days were provided by Joan Molyneaux, Olive Sheehan, John Ruttle, Damien O Grady [Rathkeale House Hotel] along with Máire Ní Chearmada and her team at Halla Inse Bán, Templeglantine. The premises of Ardagh Community Centre, Rathkeale Palatine Museum and the Railway Bar, Abbeyfeale were also made available on these occasions of which there were ten attracting a total of some 600 participants. Complimentary transport on Walk Days was generously provided by Coach House Travel. During the First Annual Big Walk, from Rathkeale to Abbeyfeale, on June 18th 2011, the GST made presentations to founder member, Máire Ní Chearmada and to Denis Foley who was the last CIE employee on the old railway line. Further recognition of the origins of the Trail was given when a Slide Show of the railway era was presented by Liam O Mahony at Newcastle West Library on Nov.4th 2011. The unfailing courtesy of the Library staff in facilitating GST events is greatly appreciated. The GST was honoured by Ministerial visits from Pat Carey T.D. in 2010 and Jimmy Deenihan T.D. in 2011. The Trail was also the recipient of an International Award from the European Greenways Association in 2011 in recognition of its efforts over the previous twenty years in campaigning for and developing the GST. This was presented in Sept. 2011 at a function held in Epinal, Lorraine, France. Appreciation of the coverage of GST news and events by all the various local and national media was expressed and Gerard O Connor was thanked for his excellent management of the GST website. The past two years have witnessed the development of the five mile Ardagh-Rathkeale section and the provision of one and a half miles of roadside cycle lanes at Barnagh and Rathkeale. These works were enabled by funding from the Rural Recreation Section of the Dept. of Environment with the work being carried out by local contractor, Declan Stack and the Dept. of Transport's Smarter Travel Scheme where the work was undertaken by Limerick Co. Co. The slow progress in completing work at one very short location was discussed and having expressed dissatisfaction at the handling of the matter by CIE/Limerick County Council the meeting unanimously agreed to publicise the issue. As you are aware the past five years have seen major progress in developing the GST with the result that 22 miles are now available for recreational use. However, one issue created then has continued to be an impediment throughout this period. The problem arose in 2007 when Limerick County Council, after vacillating on the matter, granted permission to build a "slatted house" across the railway from all the other farm buildings. <http://www.lcc.ie/ePlan/InternetEnquiry/rpt_ViewApplicDetails.asp?validFileNum=1&app_num_file=071592> This decision was at variance with the protection accorded to the railway route in both the County and Regional plans. The building, as constructed, caused further negative impact on the GST. This was due to it being built several metres closer to the railway than the permission had allowed. The attached picture shows the cattle feeding on CIE property. In total the farmer was now making use of several hundred metres of the railway as if it were his own. 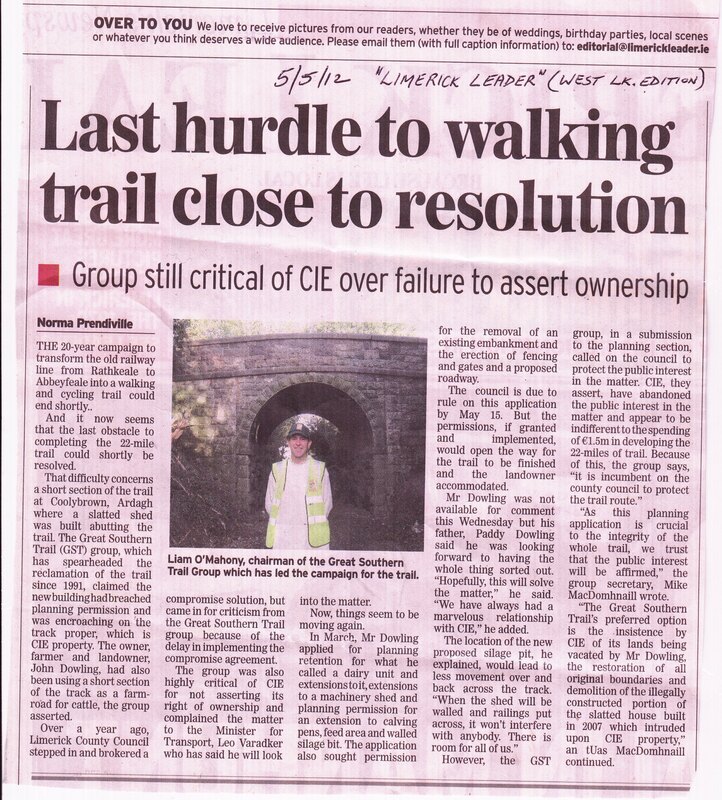 Being a distance from the public road this problem did not come to the attention of the GST until two years ago when the Ardagh - Rathkeale section of the Trail was being surveyed prior to development works. Since then one year was devoted to attempting an informal resolution. These efforts came to naught and in March 2011 the GST formally objected to the breach of planning. Several more months then passed with no visible progress. The GST then felt compelled to alert Leo Varadkar, Minister for Transport and Tourism, who is responsible for CIE. 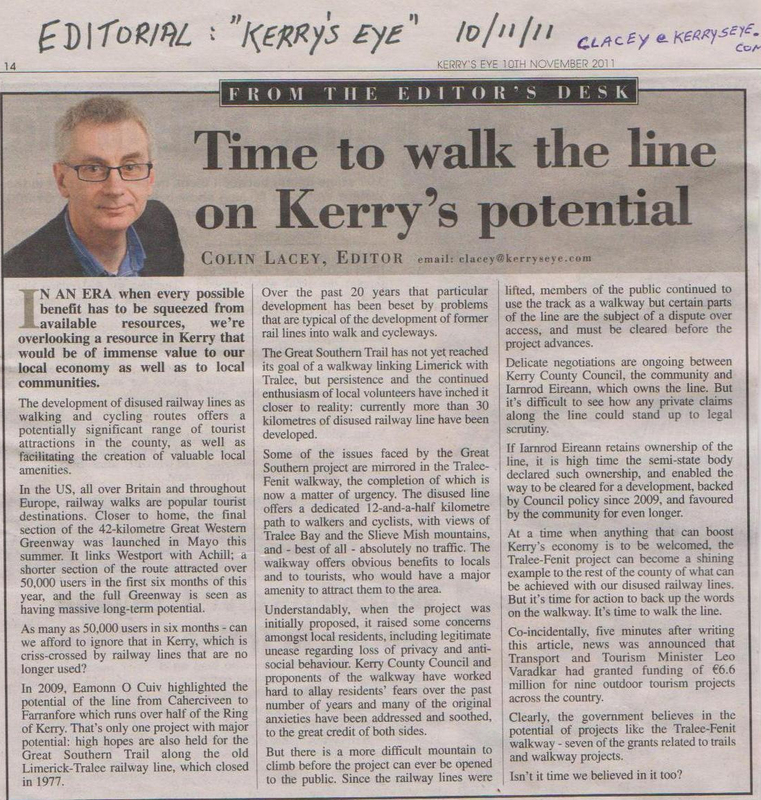 In Oct.2011 the GST, on the understanding that a compromise had been reached between CIE, Limerick Co.Co. and the farmer, agreed to facilitate this solution in the interest of goodwill. Unfortunately several more months have now passed and (as the picture shows) remedial works, although commenced, have not been sufficiently advanced to facilitate easy public use. As the Spring and Summer approach it is unacceptable that a third year of prevarication by officialdom be let pass. That was the raison d'etre for the questions below being sent to CIE, Limerick Co.Co. and Minister Varadkar prior to the GST AGM. Only Limerick Co.Co. acknowledged or replied. Their response was couched in general terms and did not address the specifics. Consequently, the AGM approved the broad circulation of these questions and your assistance is requested in attempting to get them answered or, preferably, the works completed as we would all like to 'move on'. Please consider e-mailing the questions (listed below) to Minister Leo Varadkar, Ms. Geraldine Finucane, Company Secretary, CIE and Secretary, Limerick Co.Co. minister@dttas.ie geraldine.finucane@cie.ie secretar@limerickcoco.ie You will have to provide your name and postal address to them and don't forget to ask for a response. If all our supporters do this it will hopefully give an impetus to achieving a speedy solution. Thank you. Why, in July 2007, did Limerick. Co.Co. change their stance on the location of the slatted house in the space of one week and why, in the process, did the Council permit a detrimental deviation from the Mid-West Regional Authority plan thereby lessening protection of the railway route? What efforts did the Co.Co. employ to verify that such a sensitive development had subsequently been constructed according to planning? Did any third party 'confirm' to Lk. Co.Co. that planning had been complied with? Why, when the Co.Co. planners knew informally in Autumn 2010 that something was amiss did they await a formal complaint from the GST in March 2011 before actively intervening? Why, almost a year later, in 2012, is the matter still not concluded? 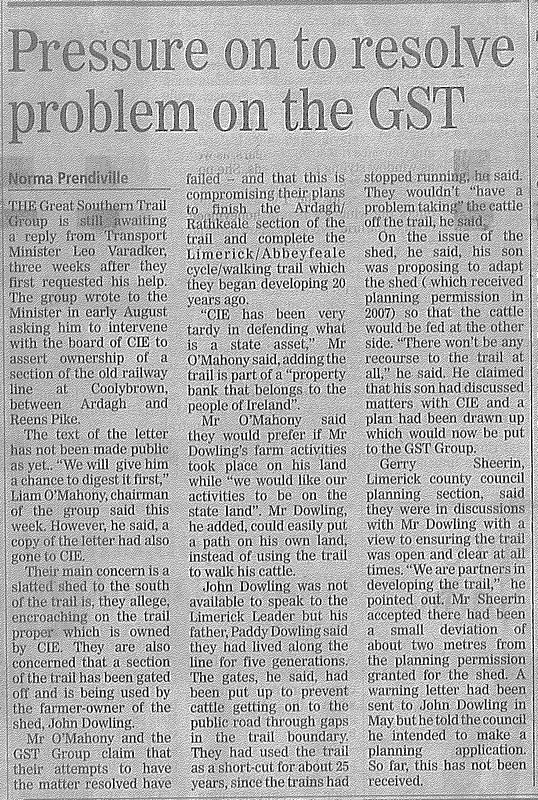 Why did CIE/IE fail to accommodate several GST requests throughout most of 2009 asking that CIE/IE officials inspect the Ardagh - Rathkeale section? When an engineer from I.E. eventually turned up in Feb.2010 and the encroachment on their property was confirmed did CIE begin any legal action to secure their property in the public interest? Did CIE at any time in 2010 ask Lk. Co.Co. to enforce the planning laws? How many representations were made to CIE in 2010-2011 on behalf of the adjoining landowner and by whom were they made? Is there any legal difficulty in permitting the CIE ground containing the fibre-optic cable being licenced to a private individual? If so who confirmed and signed off that it was built in accordance with planning? Considering that almost €1.5 million has been spent on the GST-the bulk of which is public money-is there an issue of public accountability to be addressed if the full potential of the trail cannot be realised at present due to the unresolved problem? 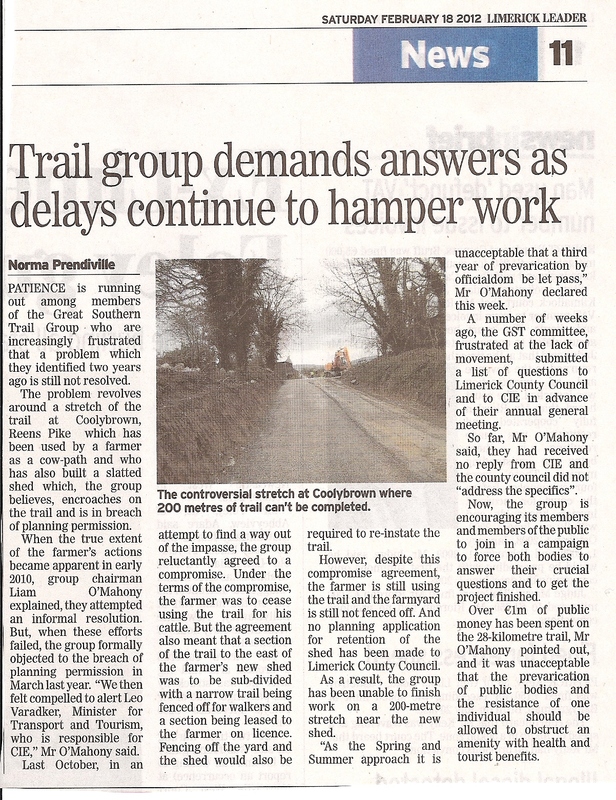 AS COMPLETION OF THE TRAIL AT COOLYBROWN IS STILL AWAITED (THE DELAY CAUSING CONSIDERABLE DISQUIET TO OUR SUPPORTERS) THESE QUESTIONS WILL BE PUT IN THE PUBLIC DOMAIN ON Thursday 2nd FEB.2012 AT THE AGM OF THE GST AND THIS ADVANCE NOTICE IS TO ENABLE CIE AND LIMERICK COUNTY COUNCIL TO RESPOND TO THOSE QUESTIONS PERTINENT TO THEM AND/OR TO BE REPRESENTED AT THE AGM. The AGM of the GST was held on February 2nd with all out-going officers re-elected in addition to new representatives from Co. Kerry being welcomed. The virtual completion of the Rathkeale - Abbeyfeale route has focussed attention on the development to be extended into the Kingdom and eventually link up with the Tralee-Fenit project. DAY 4: Touring : POWDERHAM CASTLE (home of Courtenay family, Earls of Devon with historic links to West Limerick) ; "GREENWAY HOUSE" (residence of famous crime novelist, Agatha Christie, whose play, "The Mouse Trap" has been staged for 60 continuous years in London) and also DARTMOOR, the location of the recent hit movie, War Horse. Accommodation: 3 NIGHTS B&B BRISTOL 4* RAMADA; 2 NIGHTS B&B EXETER 3*PREMIER INN Based on minimum of 20 in the group: €470.00 per person sharing with €170.00 single supplement. All supporters are welcome to attend the AGM of the GST. The Desmond Complex is located behind the Library/ Fire Station, Gortboy and vehicular access is via the Fire Station roadway. Much progress has been made since the last AGM with 22 miles[35 Km] of continuous walking/ cycling trail available along the old railway from Rathkeale to Abbeyfeale. Until now the continuity of the trail had been broken by the N21 at Barnagh and Rathkeale. The provision, by Limerick Co.Co., of 1.5 miles[2.5 Km] of dedicated cycle-lanes parallel to the N21 has resolved this issue. These works were funded under the 'SMARTER TRAVEL' programme and bring to approx. €1.5million the total outlay on the GST since development first commenced. Further upgrading of the facility for cyclists is scheduled for 2012 with support from 'LEADER' funds. The support of the general public and the various European, State and local agencies has made all of this possible. Over the years visits by Government Ministers, Dr. Michael Woods, Éamon Ó Cuív, Pat Carey and Jimmy Deenihan have also been greatly appreciated. Further recognition of the GST manifested itself in 2011 with an Award by the European Greenways Association. Regrettably works remain to be completed on one short 300 metre section of the route despite two years being spent on resolving the issue which is primarily a matter between CIÉ, Limerick Co.Co. and an adjoining landowner. Access is not impeded at this location but the sub-standard surface is most unsatisfactory. A full report will be given at the AGM by which time the situation will hopefully have advanced. Attention must now focus on the continuation of the GST into Co. Kerry for an eventual link up with the Tralee-Fenit project. The GST has several hundred supporters with a good few in Co. Kerry. The reluctance of people to seek office in voluntary organisations is well known but it is hoped that a core group of activists will attend the AGM and dedicate themselves to achieving this extension of the trail. Ní neart le cur le chéile! CHRISTMAS WALK along old railway: TUE. 27th DEC at 1pm: NEWCASTLE WEST to RATHKEALE. Nollaig Shona agus gach dea-ghuí i 2012; Happy Christmas from the Great Southern Trail and best wishes for the New Year of 2012. Sincere thanks to each and everyone who supported the GST in any way during the past year. We look forward to as many of you as possible participating in our Christmas Walk from Newcastle West to Rathkeale on Tuesday Dec.27th. at 1p.m. [WEATHER PERMITTING]. Assembly is at the Old Station, Bishop Court, Newcastle West, Co. Limerick and the 8 mile[13km] journey will take about three hours. Walkers joining at Ardagh Station should commence at 2p.m. The newly completed extension at Castlematrix, Rathkeale now enables a safe crossing under the N21 River Deel bridge and the provision of this link (and a similar one at Barnagh) by Limerick Co. Co. under the 'SMARTER TRAVEL PROGRAMME' is to be commended. At journey's end light refreshments will be provided at Rathkeale House Hotel and there will be a complimentary return coach to Ardagh/N.C.West at 5.30p.m. We thank the Hotel management and Coach House Travel for their generosity in these arrangements. We look forward to as many of you as possible participating in our Christmas Walk from Newcastle West to Rathkeale on Tuesday Dec.27th. at 1 p.m. [WEATHER PERMITTING]. Assembly is at the Old Station, Bishop Court, Newcastle West, Co. Limerick and the 8 mile[13km] journey will take about three hours. Walkers joining at Ardagh Station should commence at 2 p.m. The newly completed extension at Castlematrix, Rathkeale now enables a safe crossing under the N21 River Deel bridge and the provision of this link (and a similar one at Barnagh) by Limerick Co. Co. under the 'SMARTER TRAVEL PROGRAMME' is to be commended. At journey's end light refreshments will be provided at Rathkeale House Hotel and there will be a complimentary return coach to Ardagh/N.C.West at 5.30 p.m. We thank the Hotel management and Coach House Travel for their generosity in these arrangements. [N.B. A courtesy coach will also leave from Rathkeale House Hotel at 12.45 p.m. to connect with the start of the walk.] As a short 400 metre section of the route still awaits its final surface please wear strong, comfortable, waterproof walking shoes. Tel. or text 0876471956 for any enquiries. All are welcome to Public Library, Gortboy, Newcastle West on Friday 4th November at 8 p.m. for an evening of nostalgia as scenes from the 1970s of where the trains once ran will be presented during a slide show by Richard Wall-a lifelong railway enthusiast who travelled the route and captured images at a wide variety of locations. Over 60 people participated in the 10km walk along the GST between Abbeyfeale and Templeglantine on Sunday last. See Photos. The dull day did not dampen the spirited group who were rewarded at journey's end with a feast of tea, scones and a variety of cakes and tart at Halla Inse Bán. Míle buíochas le Máire Ní Chearmada agus a lucht tacaíochta for preparing such a generous repast. The return to Abbeyfeale was courtesy of Phelim's Coach House Travel. The GREAT SOUTHERN TRAIL (GST) has been the recipient of a prize at the 5th European Greenways Ceremony on the 8th of September 2011 which took place in Épinal, the Vosges Region, (France). Eight greenways from France, Ireland, UK, Italy and Spain were awarded as reference of best practices in Europe. The Award ceremony was held in the Vosges city of Épinal(France), during the 15th Rencontres des Départements & Régions Cyclables de France. This 5th European Greenways Award (EGA) has been organized by the European Greenways Association (EGWA) in cooperation with the association Départements & Régions Cyclables (DRC) de France and the Conseil Général des Vosges, with the support of the DG of Enterprise and Industry of the European Commissionand Council of Europe / European Landscape Convention, the Ministère de l’Écologie, du Développement Durable, des Transports et du Logement (France) and the Walloon Region (Belgium) . The European Greenways Awards (EGA) contribute to the promotion of best practices in greenways. It encourages the qualitative development of these facilities opened to the general public in Europe, defined as “Communication routes reserved exclusively for non-motorised journeys. These routes should meet satisfactory standards of width, gradient, and surface condition to ensure that they are both user-friendly and low-risk for users of all abilities. In this respect, canal towpaths and disused railway lines are a highly suitable resource for the development of greenways” Greenways are known with different names depending on the country: Voies Vertes, Vias Verdes, RAVEL, Ecopistas, Radwege auf alten Bahntrassen, railtrails, etc. The European Greenways Awards (EGA) were created in 2003 and have since been held every two years . In this 2011 edition the jury have honoured projects in two categories: “Excellence” and “ Exemplary Initiatives”. The EGWA has been delighted to receive 20 exceptional candidates from 10 countries. For the excellent quality of the Greenway as a whole and its appeal to tourists, and its future plans for international connection. For the integration of an excellent Greenway in a very attractive and territorially complex setting on the Mediterranean coast. For the excellence of its conception, design and technical execution as a Greenway, especially its magnificent bridge, which enhances the daily mobility of all kinds of users. In recognition of the efforts made for the last 20 years by the volunteer enthusiasts of the GST who, with their tireless endeavour, have succeeded in making reality the conversion of a dissused railway line into a Greenway to be enjoyed by all. 1st Prize: Discover the Secrets of Girona Greenways (Spain) / Consorci Víes Verdes de Girona. For an innovative action with major impact on the outreach and promotion of the Girona Greenways as a resource for discovering the cultural and natural value of the region. For the use of Greenway and art as a tool for social integration and cohesion in a difficult socio-economic environment. For the development of a cycling and walking tourism product in Tuscany that allows users to enjoy nature, the art of bygone days, and human contact, taking advantage of a historic work of hydraulic engineering. 3rdPrize: Hotel and restaurant railway wagons on La Jara Greenway - (Spain) / Mancomunidad de la Vía Verde de la Jara. For reusing old railway coaches placed on the Greenway itself as facilities for visitors in an isolated and depressed rural area. 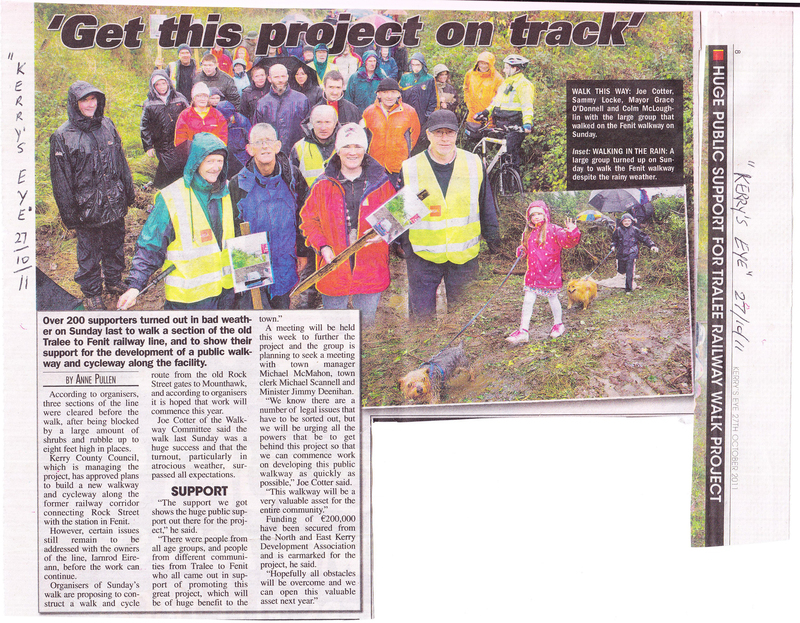 Attached are two newspaper articles: The first is by Norma Prendiville, "Limerick Leader" 17/9/11 and the second by Marisa Reidy "The Kerryman" 14/9/11 which report on the European Greenways Award won by the GST. expressing your support for the project and stating your name and address. The letter must be with the Council by Friday16th September 2011. And it is more ecologically friendly !!! However, if you use the electronic medium please check that you receive an acknowledgement. I hope that you will oblige with my request and perhaps even encourage others to write also. Believe me, it is important. Ní neart go cur le chéile! P.S. Please forward this e-mail to your friends who may wish to add their support. 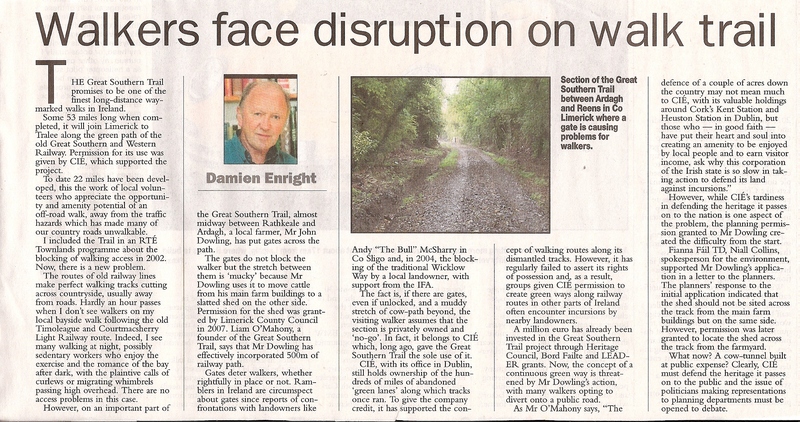 The attached article Mr. Damien Enright writes for the Irish Examiner on difficulties experienced by the Great Southern Train group with Ardagh farmer Mr. John Dowling. In the attached article Mr. Gerry Sheerin, Limerick Co. Co. planner states that the Council is a 'partner' in the GST project. One could agree that this was indeed true with respect to the handling of application 07/1592 http://www.lcc.ie/ePlan/InternetEnquiry/rpt_ViewApplicDetails.asp?validFileNum=1&app_num_file=071592 until 23 July 2007. On that day, having considered the application received several weeks earlier and having perused the previous planning history of that location it was the considered judgement of two planners that the proposal was contra to the protection afforded the railway route in the County Plan. Therefore, they wrote to Mr. Dowling asking him to relocate the proposed building to the other side of the railway. One week later, instead of receiving a new plan, the Co. Co. was presented with a copy of historic material already on file. This obviously added nothing to the sum total of the knowledge already available to the planners. Yet this 'ZERO SUM' must have been so compelling, conclusive and convincing to those within the confines of the Planning section that , within 24 hours, they executed a complete and total volte-face by approving the unamended application despite its conflict with the County Plan. The building was then constructed but deviated from the permission granted thereby impacting even more negatively on the railway. The expeditious and decisive action by the Council , on 31 July 2007, in acceding to Mr. Dowling's application has certainly not been noticeable during the past 24 weeks (not hours) since the GST alerted the planners to the clear and obvious breach of the 2007 planning permission. Instead we have Mr. Sheerin describing it as 'a small deviation'. Fine, perhaps, if it happened in the centre of a large agricultural field. Not so fine if it happened at the face of an urban street or footpath which is the relevant comparison in this instance. SUBJECT TO THERE BEING SUFFICIENT INTEREST THE GST IS PROPOSING TO VISIT CO. MAYO AND THE WEST FROM MON. 26th TO WEDNESDAY 28th SEPTEMBER. THE COST WILL BE €280- €300 approx TO INCLUDE 3 DAYS COACH HIRE FROM NEWCASTLE WEST [pickup en route if requested]; 2 NTS. B&B, PPS, IN A 3 OR 4 STAR HOTEL IN WESTPORT TOWN; ONE LUNCH, ONE DINNER; ONE DAYS BICYCLE HIRE TO CYCLE THE 25 MILES FROM WESTPORT-NEWPORT-MULRANNY-ACHILL ON THE GREAT WESTERN GREENWAY. THE MONDAY JOURNEY WOULD BE VIA CONNEMARA WITH A STOP AT BALLINAHINCH CASTLE, NEAR RECESS, TO WALK A SECTION OF THE OLD CLIFDEN RAILWAY LINE IN THE CASTLE/HOTEL GROUNDS AND TO HAVE LUNCH IN THE HOTEL. TUESDAY WOULD BE CYCLING DAY WITH RETURN FROM ACHILL BY COACH AND DINNER AT OUR HOTEL. WEDNESDAY WOULD BE A LEISURELY RETURN TO CO. LIMERICK VIA THE HIGHWAYS AND BYWAYS OF MAYO, ROSCOMMON, VISITING SOME PLACES OF HISTORIC INTEREST, BEFORE CROSSING THE SHANNON AT ATHLONE. A MINIMUM OF 20 PERSONS IS REQUIRED FOR THE TRIP TO PROCEED. A DECISION WILL HAVE TO BE MADE BY SAT. 3rd SEPT. PLEASE E-MAIL IF YOU ARE INTERESTED TO <lomahony@hotmail.com> DURING THE COMING WEEK. Join Minister Jimmy Deenihan T.D. in rail-trail walk from Newcastle West, Co. Limerick to Barnagh Tunnel this Heritage Sunday 28th August at 3 p.m. The Great Southern Trail is delighted that the Minister for Arts, Heritage and the Gaeltacht, Mr. Jimmy Deenihan T.D. will be participating in the walk from Newcastle West to Barnagh on Sunday August 28th. Assembly is at Newcastle West Station House, Bishop Court, Town Centre at 3 p.m.The walk is 6 miles uphill at a gentle railway gradient. Along the route there are scenic views, a 130 year old viaduct and the walk will terminate deep inside the equally venerable 130 yard long tunnel. Complimentary refreshments will be provided at 5.15 p.m. by the Sheehan family at the nearby Barnagh Gardens which will be open specially for the day. Coach House Travel are then providing a complimentary coach to return walkers to Newcastle West at 6 p.m. Fáilte roimh gach éinne. Attached is a self-explanatory article in today's Irish Times concerning a short section of the GST between Rathkeale and Ardagh. Please note that the "undeveloped section" referred to involves only a short stretch at and near the location of the farm. The other 8km between Rathkeale and Ardagh has been fully surfaced by the GST in the past year. The work was grant aided to the amount of €100,000 by the then Dept. of Community, Equality and Gaeltacht Affairs. The 500metre unimproved, sub-standard, section is still walkable and four organised walks have already traversed it. This Heritage Sunday, August 21st, a 3 p.m. walk from Rathkeale [Palatine Centre] will also travel the entire route to Ardagh where refreshments will be provided before returning to Rathkeale by coach. Beidh fáilte roimh gach éinne. A number of other events also took place in the course of the day. Following morning tea and home-made scones provided by Joan Molyneaux in Ardagh Hall one of seven new information boards along the GST was unveiled by Fr. Larry Madden P.P. Austin Bovenizer, who crafted the signage was also present. Fr. Madden also displayed a replica of the Ardagh Chalice which was once awarded at the Gregorian Chant Primary Schools Competition. The group then continued to Newcastle West for a ninety minute lunch break. At the Barnagh Gardens (close to the tunnel), Olive Sheehan served complimentary Afternoon Tea which was much appreciated after the six mile ascent from Newcastle West. During this rest period a presentation was made to Máire Ní Chearmada to mark her many years of devotion and commitment to the GST as its Joint Treasurer. Later in the evening eighty-nine year old Denis Foley, the last CIE employee on the line, unveiled the Devon Road Station information sign. Denis was also the recipient of a presentation. Among the attendance were Barry Carse and Richard Wall of the Irish Railway Record Society who kindly made available several of the historic photos portrayed on the signage. This was the first event on the GST to link all three West Limerick towns of Rathkeale, Newcastle West and Abbeyfeale along with the villages of Ardagh and Templeglantine. Saturday 18th June will celebrate both the twenty years since the establishment of the Great Southern Trail Action Group and the recent extension which now enables the Rathkeale to Abbeyfeale section of the old Limerick-Tralee railway to be used for cycling/walking. This 22 mile [35km] route is the longest developed rail-trail in Ireland and it is appropriate that the route be traversed in its entirety around the longest day in the year. Participants may join in for a short walk, a medium stretch or the entire route. For those considering the shorter lengths Bus Éireann coaches www.buseireann.ie stop hourly at six locations which are close to the GST. Those who intend walking the full 22 miles should register at 8.45am in Rathkeale. A special B+B rate [€40 sharing/ €45 single] for those wishing to overnight in Abbeyfeale will be available from Leen's Hotel www.leenshotel.com; leenshotelabbeyfeale@eircom.net Participants should book this directly with the hotel. A Certificate will be provided to all who WALK the entire route as a reward for their endurance. Intention to register should be notified to greatsoutherntrail@gmail.com prior to June 18th to assist in the planning logistics. 11.30am Depart Ardagh after refreshment stop. It is hoped to provide a barbeque at Abbeyfeale. All WALKERS arriving in Abbeyfeale will be provided with return transport to their starting point on Saturday night or on Sunday should they wish to overnight in Abbeyfeale. Unfortunately, the GST will not be able to transfer the bikes. However, we will provide secure overnight storage. Beidh fáilte romhat ar an lá. A large group of over 40 persons took advantage of the beautiful spring weather on St. Patrick's Day to ramble along a newly restored section of the old Limerick-Tralee railway. The walk, of 6 miles, commenced at the Old Station [now the Palatine Museum], Rathkeale, Co. Limerick where refreshments were also provided at journey's end. The walk was organised by The Great Southern Trail's www.southerntrail.net Rathkeale co-ordinator, Mr. John Ruttle, who expressed his satisfaction with the day. Mr. Ruttle also thanked those who helped him in the arrangements. At 3 p.m. on St. Patrick's Day, Thursday 17th March 2011 a walk will set out from the Old Station [now the Palatine Centre], Rathkeale, Co. 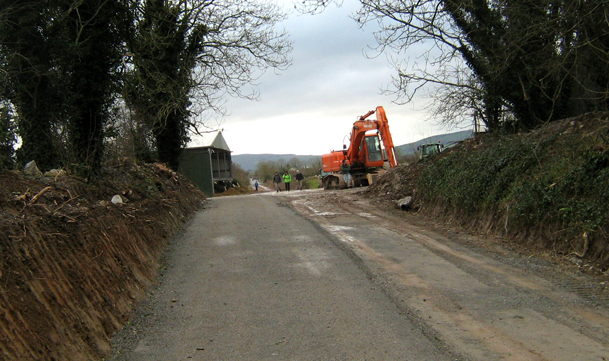 Limerick to travel over the newly surfaced section of the old railway to Clounagh, near Reens Pike. The return trip is 6 miles and refreshments will be provided at journey's end. Beidh fáilte romhat; bí linn ar an Lá Mór Náisiúnta agus bain taitneamh as Lá Fhéile Pádraig amuigh faoin spéir! This 23 mile [37km] route is the longest developed rail-trail in Ireland and it is appropriate that the route be traversed in its entirety around the longest day in the year. Participants may join in for a short walk, a medium stretch or the entire route. For those considering the shorter lengths Bus Éireann coaches www.buseireann.ie stop hourly at six locations which are close to the GST. Those who intend walking the full 22 miles should register at 8.45am in Rathkeale. The registration fee will include lunch/ evening meal vouchers as well as a special B+B rate for those wishing to overnight in Abbeyfeale. A Certificate will be provided to all who WALK the entire route as a reward for their endurance. Intention to register should be notified to greatsoutherntrail@gmail.com prior to June 18th to assist in the planning logistics. 11.30 a.m. Depart Ardagh after refreshment stop. 2.00 p.m. Depart Newcastle West after break for lunch. 4.30 p.m. Depart Barnagh after visit to 1880 railway tunnel. 6.00 p.m. Depart Templeglantine after refreshment stop. All WALKERS arriving in Abbeyfeale will be provided with return transport to their starting point on Saturday night or on Sunday should they wish to overnight in Abbeyfeale. Cyclists should make their own arrangements for returning to their starting point. Beidh fáilte romhat ar an lá. Attached is a five page personal account by me of the first 20 years of the Great Southern Trail campaign and development. I wrote it for the NEWCASTLE WEST HISTORICAL SOCIETY JOURNAL No.4 which was published in December 2010. I hope that you will enjoy reading it [it will be slow to download!]. You are free to reproduce it but please credit me as author, Owen O'Neill [Snr.] R.I.P. for the photograph and the Newcastle West Historical Society Journal as publishers. Nollaig Shona agus gach dea-ghuí i 2011; Happy Christmas from the Great Southern Trail and best wishes for the New Year. The Church gate collection in Rathkeale on 13/14 Nov.2010 realised €453. Míle Buíochas to all who donated and to those who collected. 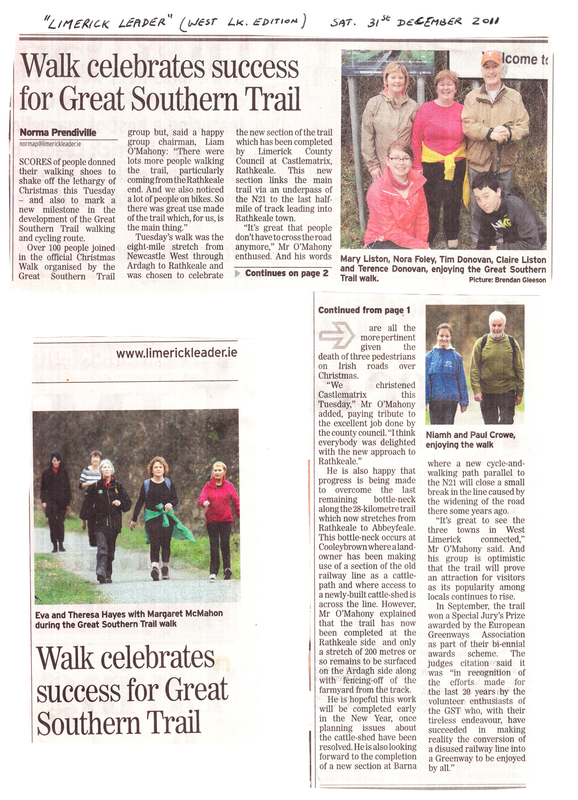 Also on Sunday 14th Nov. about 40 people participated in the walk along the Trail from Rathkeale to Reens. It was great to see so many new faces on the day. Such was the beautiful afternoon that a few Kerry/Cork visitors decided to complete the entire 8 miles to Newcastle West. However, earlier the previous week a group of students and teachers took on the even more daunting challenge of a round trip walk between the two towns. Maith sibh; keep up the exercise! On Monday, December 27th 2010 at 1:00pm there will be a Christmas walk from NCW to Rathkeale with complimentary return transport. Make a note in your diary. On Sunday Nov.14th at 2pm there will be a walk from the Old Railway Station in Rathkeale along the Great Southern Trail to Clonagh Bridge [near Reens Pike]. The journey is about 6 miles round trip. Please bring a visibility vest and strong footwear as the Trail still awaits its final surface. It is possible to exit the Trail at Clonagh Bridge and return by the N21 hard shoulder if anyone so wishes. National Trails Day [Sunday 3rd October] was the occasion used to celebrate the latest extension to the Great Southern Trail. In excess of 100 people of all ages from West Limerick, North Kerry and further afield enjoyed an 8 mile walk in pleasant autumnal conditions between Newcastle West and Rathkeale. 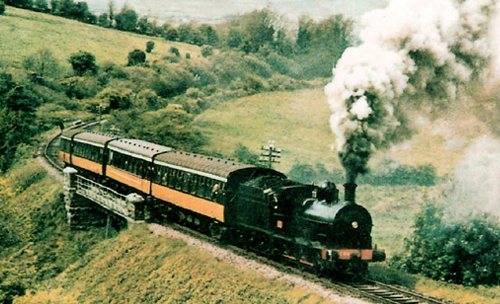 Two coaches were required to return the group from Rathkeale Old Station to N.C.West Old Station. The portion of the route from Ardagh through the townlands of Kilreash, Liskilleen, Skehanagh, Coolybrown, Clonagh, Ballinlyny and Castlematrix to Rathkeale hadn't seen any organised walk for over six years. It has recently been cleared of vegetation and prepared for public use by the GST with grant aid from the Dept. of Community, Equality and Gaeltacht Affairs. Apart from a couple of spots where remedial works are yet to be undertaken the Trail was easy to negotiate and favourably commented upon by the participants. In an address the Cathaoirleach of the GST, Liam O'Mahony, emphasised the importance of this day when for the first time in the twenty year existence of the GST it is possible to utilise the 22 miles of the old railway between Abbeyfeale and Rathkeale for recreation. Mr. O'Mahony thanked all the stalwarts who had campaigned for the GST throughout the 1990s when it had been a fairly lonely task. He recalled three very supportive and visionary advocates for the Trail from the Rathkeale/Reens Pike area who are now sadly deceased; Mike Hanley, Patrick Johnson and Paddy McCormack R.I.P. GREAT SOUTHERN TRAIL [GST] INVITES ALL ITS FRIENDS TO A CELEBRATORY WALK ON SUN.3rd OCT. The GST invites all its members and supporters to participate in the walk from the Old Station ,Bishop Court, Newcastle West, Co. Limerick at 3 p.m. on Sunday 3rd October to jointly celebrate National Trails Day and the latest extension of the GST. The walk's destination is Rathkeale, a journey of about 8 miles and complimentary return transport will be provided. This is the first opportunity in many years to traverse much of the route. As it is still a 'work in progress' waterproof footwear is recommended. The connection of the three principal West Limerick towns of Abbeyfeale, Newcastle West and Rathkeale by Rail-Trail is a major achievement of the GST. It would not have been possible without the support of several State and Local agencies. However, their support would never have been forthcoming without the determined and consistent campaign of the ordinary people throughout the 1990's. Therefore, it is the fervent wish of the GST that as many as possible of these stalwarts will be present on Sunday to see at first hand the fruits of their endeavours. The extension currently being carried out along the Ardagh-Rathkeale stretch of the old Limerick to Tralee railway will result in a further 5 miles of route being added to the GST. This linkage of the seven Parishes from Rathkeale to Abbeyfeale provides a safe 35km off-road recreational pathway. It almost completes the conversion of the Co. Limerick half of the railway. The historic route contains nine fine dressed stone overhead bridges, one tunnel, one restored viaduct along with a number of bridges which carried the trains over roads, fields and rivers. There are also a number of former railway houses which are now privately owned. Furthermore, the trail traverses a varied and scenic landscape. The latest works are funded by the Dept. of Community, Equality and Gaeltacht Affairs with the work being carried out by Declan Stack, Contractor, Devon Road, Co. Limerick. There will be a walk on Saturday 25th September at 1 p.m. from the N21 lay-by at Barnagh [between Newcastle West and Abbeyfeale]. This is an annual event held to support the Irish Heart Foundation. Denis McAuliffe [087 2030535] will lead the walk which will last for about 2 hours. The route, along the old railway, will include Barnagh Tunnel and Fergusons Viaduct which are outstanding features of the Great Southern Trail. All are welcome and all donations will be appreciated for the Heart Foundation. The GST is very appreciative of the generosity of Noreen O' Connor, 3 Upper Colbert St., Athea in providing two seats between Abbeyfeale and Barnagh to allow walkers have a restful break along this very popular scenic route. Finally, a reminder of the National Trails Day Walk from Newcastle West to Rathkeale at 3 p.m. on Sun.3rd Oct. Description of event 12km (7½ miles) walk between both towns using existing and newly developed sections of the former railway. Time of event Assembly at 3:00 p.m. THE GREAT SOUTHERN TRAIL [GST] www.southerntrail.net WELCOMES THE RECENTLY LAUNCHED SCOPING STUDY [below] INTO THE PROVISION OF A NATIONAL CYCLE NETWORK WHICH WILL INCLUDE THE GST. THIS RECOGNITION IS VINDICATION OF THE EFFORTS OF OUR VOLUNTARY GROUP OVER TWENTY YEARS. HOWEVER, THE STUDY FAILS TO ACKNOWLEDGE THAT THE GST CAMPAIGN AND DEVELOPMENT HAS ACTUALLY PROVIDED A PUBLIC AWARENESS AND A TEMPLATE WHICH CAN BE USED TO EXPEDITE FURTHER EXPANSION IN A MOST COST EFFECTIVE WAY. THEREFORE, THE GST IS OF THE VIEW THAT COMPLETION OF A LIMERICK-TRALEE CYCLEWAY SHOULD BE GIVEN AN EQUAL PRIORITY AS THAT FROM DUBLIN TO GALWAY. IT WOULD LINK TWO LARGE CONURBATIONS [EACH CLOSE TO AN AIRPORT] WITH A NUMBER OF SIZEABLE INTERMEDIATE TOWNS. WITH PROPER MARKETING IT SHOULD BE AN IMPORTANT ADDITIONAL TOURISM ATTRACTION AS WELL AS BENEFITTING LOCAL PEOPLE OF ALL AGES AND ABILITIES. THE GST IS REQUESTING SUPPORT FOR THE EXISTING ABBEYFEALE TO ARDAGH [CO. LIMERICK] TRAIL TO BE EXTENDED IN BOTH DIRECTIONS. 9 BISHOP ST., NEWCASTLE WEST, CO. LIMERICK. Ireland's National Cycle Policy Framework presents a vision of "creating a culture of cycling in Ireland". The policy aims not only to deliver a five-fold increase in cycling for commuting purposes, but it also explicitly recognises the need to support and encourage all other types of cycling, including recreational and tourist cycling. "Recreational routes", says the policy, "in and around urban areas, which in turn link to rural areas, are very important." In response to this objective, and at the request of the Minister, the National Roads Authority undertook to carry out a scoping study into the delivery of a National Cycle Network that would encourage cycling as a transport mode, leisure activity, and tourist attraction in Ireland. An advisory group, under the auspices of the National Trails Advisory Committee assisted in the project. The result of the scoping study is an outline of the corridors that a proposed National Cycle Network would consist of. The nodes of the proposed network are settlements around Ireland with populations of 10,000 or more, and the identified route corridors also tie into tourist attractions around the country. The resulting potential Network identified in the scoping study is approximately 2,000km in length. It is envisaged that the identified route corridors will provide a skeleton around which routes should develop nationwide, with potential for links into and between the corridors, particularly where existing infrastructure allows cost effective delivery. As a step towards moving from the scoping study to implementation, the NRA are to undertake a route feasibility and delivery study for the Dublin-Galway corridor. This work will include, an examination of all options for route sections along the corridor, development of appropriate design standards and construction specification, a tentative construction delivery programme, and the development of a robust cost estimate. The advisory group which assisted in the National Cycle Network scoping study will continue to assist in this next step. ­The National Cycle Network Scoping Study ­ can be downloaded here. Event Description: 10K ramble/cycle along old railway from Newcastle West to Barnagh. Scenic route with restored viaduct. Concludes with tour of Barnagh tunnel. Walkers and cyclists are availing of the long fine spell to explore the GST from Abbeyfeale to Ardagh; enjoying the safe traffic free route which is very well maintained by the workers on the Rural Social Scheme. The generosity of the rural communities along the way is greatly appreciated with €1549 being collected at recent Churchgates as follows: Ardagh/Carrigkerry €496;Templeglantine €456;Monagea €301 and Kilcolman/Coolcappa €296.The urban centres of Abbeyfeale, NCWest and Rathkeale will hold their collections later in the year. These funds will assist in the development of the Ardagh to Rathkeale section where the initial clearance earlier this year will be augmented by further works in the near future. The financial assistance of the Dept.of Rural,Equality and Gaeltacht Affairs is invaluable in enabling this latest extension to be progressed. Indeed, the Department has consistently supported the GST over several years. The GST was represented by Vice-Chairman Denis McAuliffe at the International Greenways Conference in Madrid earlier this month. Over 160 delegates attended and all were provided with literature and information on the GST. A full report on the Conference will issue later. The new Minister for Community, Equality and Gaeltacht Affairs, Mr. Pat Carey, TD visited the Great Southern Trail (GST) on Friday, 16th April. He was accompanied by his Press Secretary, Tadhg Ó Gairbhí, a native of Rathkeale and Ms. Sorcha de Brúch, Personal Secretary. He was welcomed to Ardagh by Mr. Liam O'Mahony, Cathaoirleach, GST who expressed appreciation for the Department's continued support of the Trail's development and expansion. The Minister received briefings from Mick Dwyer, Assistant Divisional Engineer, Iarnród Éireann; Anthony Coleman, Limerick County Council; Shay Riordan, Manager, West Limerick Resources and Barry Connolly, Manager, Rural Social Scheme. The Minister viewed the previously developed trail from Abbeyfeale to Ardagh and walked along a short section of the newly cleared extension to Rathkeale. He looked forward to the integration of this additional section into the walking / cycling route and complimented all concerned for their efforts to enhance the amenities for the people of the locality and visitors alike. THE GST FEATURED IN THE TRAVEL/RECREATION SECTION OF SATURDAY'S [10TH APRIL] 'IRISH INDEPENDENT'. THE ARTICLE WAS PENNED BY THE RENOWNED TRAVEL WRITER, CHRISTOPHER SOMERVILLE, WHO WAS INVITED TO VISIT THE GST ON THE INITIATIVE OF VICE-CHAIRMAN DENIS MCAULIFFE. THIS EXPOSURE TO SUCH A WIDE READERSHIP WILL UNDOUBTEDLY RESULT IN GREATER AWARENESS OF THE GST AND SHOULD RESULT IN MORE VISITORS TO THE AREA. THE GST WORKS OFFICER, TOM MCCOY, ACCOMPANIED MR. SOMERVILLE AND SHOWED HIM SOME OF THE SPECIAL FEATURES OF THE TRAIL. MR. SOMERVILLE'S WEBSITE www.christophersomerville.co.uk IS WELL WORTH A VISIT BY ANYONE PLANNING A WALKING TRIP. THE GST IS MOST APPRECIATIVE OF THE COLLABORATION BETWEEN CHRISTOPHER, DENIS AND TOM. On the Great Southern Trail website www.southerntrail.net [click on 'photos' and then click on 'trail photos 2009'] you may now view over 100 photos of the 10 mile section between Newcastle West Station House and Devon Road Station House. Both of these tastefully restored buildings are a credit to their respective owners. There are also scenes of other aspects of railway heritage; gates, bridges, tunnel etc. These caught the eye of the photographer M. Gilbert Perrin, President of European Greenways. He walked the route on August 19th 2009 accompanied by some Great Southern Trail members. M. Perrin also met the Rural Social Scheme workers who maintain the Trail. Subsequent to the visit the Great Southern Trail has become a member of the European Greenways Association www.egwa-aevv.org whose website will introduce you to numerous other trails. DIARY DATE: EASTER MONDAY, APRIL 5th AT 2pm ABBEYFEALE STATION JOIN IN THE ANNUAL DOG WALK DAY AND BRING ALONG YOUR FOUR-LEGGED FRIEND [ON A LEAD!]. THIS IS A NATIONAL CHARITY EVENT IN AID OF THE CARERS ASSOCIATION AND CONTRIBUTIONS WOULD BE APPRECIATED. WALK AS FAR AS YOUR DOG WILL TAKE YOU. Works Officer; Tom McCoy, NCWest. As there are seven Parishes traversed by the Trail between Rathkeale and Abbeyfeale the AGM decided to elect a Local Coordinator for GST affairs in each Parish as follows: Abbeyfeale-Eileen Woulfe, Cratloe West; Templeglantine-Denis McAuliffe; Monagea-Morgan O'Shea, Ballyshane; NCWest-Mike Mac Domhnaill, Gortbuí; Ardagh-Tom Heffernan, Kilrodane; Coolcappa-Nora O'Grady, Ballykenry; Rathkeale-John Ruttle, Church St. The growing popularity of the GST throughout its length was much remarked upon at the meeting. This fact was illustrated by the visit of ninety Limerick City walkers to the Abbeyfeale-Barnagh section recently with consequent benefit to local enterprises.